“HEAR US”! 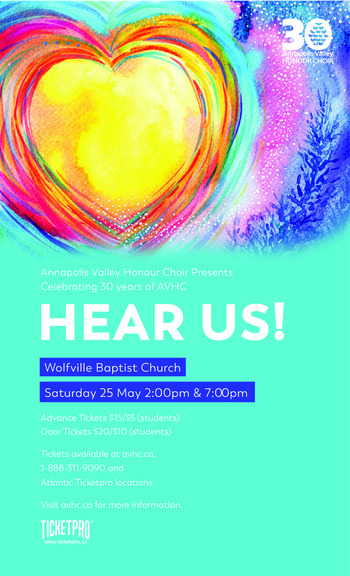 Annapolis Valley Honour Choir presents a celebration of youth in its 30th annual spring concert! “Hear Us!” is the final concert of their 30th anniversary season. The music speaks to cherishing childhood, growing up, and the importance of listening to our young people about what they have to say about the world they see. This uplifting music oozes with heart and positivity. It will make you want to dance, laugh, cry, and sing along! Come celebrate 30 years of AVHC’s contribution to the community through their music and help launch them into their future. Don’t miss this concert of the year!